Basically, it polls the content area for changes, and when triggered, runs it though a filter. The above is extensible, and by adding additional “apply_shortcode” calls from “apply_filters“, more shortcodes can be simulated. I’m pleased to present The Cartographer Clipper, the perfect accompaniment to The Cartographer! 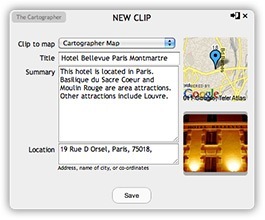 The Clipper is a bookmarklet that works in any modern web browser, and lets you clip information from any website — hotel directories, restaurant websites, even forum postings — to Google My Maps. Addresses are auto-discovered via some super-sleuthing magic, images pulled out and any selected text is placed into the description. You can save to an existing map, or create a new one on the spot. It’s great for doing travel or errand research — find a good hostel (or just the closest Apple store! ), just click the “Clipper” button, then “Save”, and it’ll appear on your maps in The Cartographer, all automatically. It’s free for use, and all it needs is any modern web browser, and a Google account. Install The Cartographer Clipper here. It’s still in beta, so do let me know if you have any trouble! mikeash.com: Method Replacement for Fun and Profit Method replacement and method swizzling in Objective-C. The user can choose his preferred Twitter client at any time, and launch the application by a simple touch; the TwitterClientManager class stores the selected value in the user settings. I recently became disgruntled with the way my blogs displayed search results. By default, WordPress blogs will show searched posts exactly as they might appear on an index or archives page: Typically as an extract, or perhaps even as the full entry. This doesn’t help at all if you’re looking for something in particular – It’s a much better idea to show the post within the context of the search query, as real search engines do. See it in practice here. This is a fairly easy thing to actually get working in WordPress. It’ll take just a couple of minutes, and will make a big difference to blog visitors. Here’s how I did it. Twitter doesn’t yet come with its own inline image support, so we tend to be limited to using image hosting services, and linking to them with short URLs. So, services like Tweetpic host the image, and we direct traffic to them in return. Thinking it’s better to keep things in the family, and take better advantage of that traffic, I put together an image hosting setup of my own. Now viewers come to my own site, instead of someone else’s! The setup consists of an Automator service, and some PHP smarts on the site. Under Snow Leopard, I can right-click on an image in Finder, click ‘Send Image to Image Hosting’, type in a title, then paste the URL that’s automatically been put onto my clipboard into a tweet. PHP: Display Adobe PSD files on a web page "Any webdesigner know the PSD filetype, which is the Adobe Photoshop format. PSDs have a lot of great features, as such as layers, but they can’t being read by a browser. Unless you use this great PHP class!"